Obesity and dementia are the fastest growing diseases of our time. The rate of occurrence is escalating and obesity is considered to have reached epidemic proportions. There has therefore emerged a societal need to facilitate those suffering with these conditions. The site of this project is Mona Vale Hospital, situated on 9 hectares of coastal land on Sydney’s Northern beaches. Architecturally landscape the grounds which are underutilised. Transform the ground level of the main building into a facility to cater to the precise needs of those who suffer with stage two Alzheimer’s disease. And to accommodate the Morbidly Obese with surgical, rehabilitation and educational facilities on levels four and six of the main building. For the majority of people with Alzheimer’s disease today, the 1960s would be reminiscent of their prime years in life. The 60s was the MOD era, the music, the fashion, the fabrics, the architecture and interior design, all colourful and vibrant. Embracing the MOD aesthetic in this project, sufferers of dementia are reconnected to a time they may well relate to, placing them in both familiar surrounds and an environment completely safe for them to wander endlessly as they do, with pleasurable experiences along their journey. The Alzheimer’s grounds are demarcated with a maze like hedge enclosing a St Tropez like resort, incorporating cocktail marques and lounging beachside day beds and chairs, a classic Aston Martin that residents imagine they are driving, a shallow lake with a row boat and fishing pontoon and for those splendid northern beaches sunsets, a beer garden. In the grounds are the pets and chooks that residents could nurture, inside, they would have their own personal memorabilia, such as a recognisable dressing gown they had had for years, hanging in the doorway of their room. Activity areas such as flower rooms where flowers from the garden could be arranged, supervised cooking facilities with safety features, library, art studio where residents could be as messy as they wished to be, providing a feeling of being at home rather than living in a home. Other safety features would include light sensors which automatically illuminate the path to the toilet, visible from the bed, and signals to alert the night nurses that the resident was mobile. Camouflaged doors, and floor surfaces delineating areas unsafe or no go zones for residents replace institutional locks and barriers. To surgically and therapeutically treat those who have become Morbidly Obese, larger spaces and appliances are required. 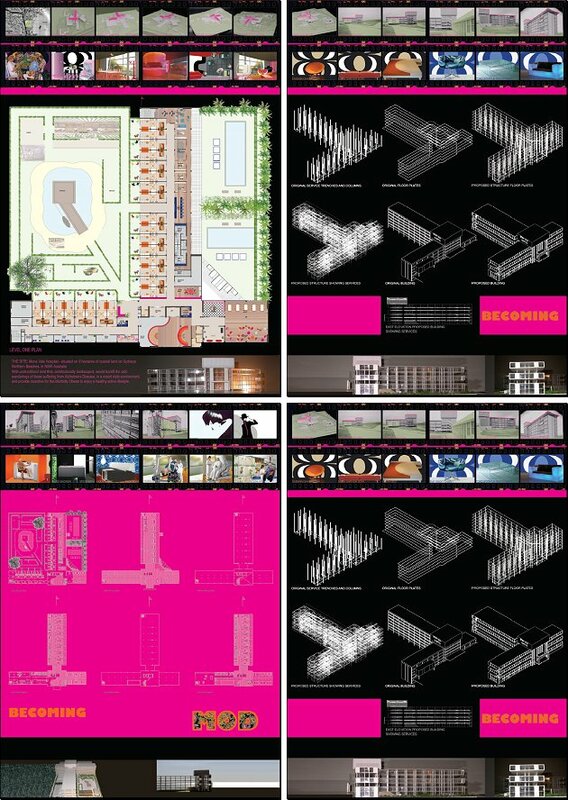 In this project I have addressed not only the spatial considerations, as well, the issues of indulgence. Apart from specifically designed operating theatres and rooms, patients would be educated and rehabilitated to indulge in more therapeutic desires other than food. A day spa has been incorporated where patients can enjoy treatments that feel fabulous, and learn to appreciate their bodies and gain incentive to be more mobile. There is an indoor swimming pool and another in the grounds on the eastern side of the building which has been demarcated specifically for their use. The patient rooms all face east to enjoy the sensational sunrises over the surf beach. The remaining grounds of the hospital encourage a self sustainable environment, with organic vegetable gardens and wind turbines segregating the hospital from the adjoining golf course. Gilles Deleuze, a French philosopher of the late 20th century writes of the concept that “everything real is already determined by its possibility and reality must follow the latter”. He nurtures the idea of a ‘creative process of actualization’. This means, what happens within the ‘event’ does not have to follow a ready-made plan, but comprises spontaneous organization through its ‘actualization’ within time. Becoming understood in this way leads to the dismantling of the very concepts of self-consciousness. Sufferers of both Alzheimer’s and Morbid Obesity are disconnected from community. In this project it is my intention to help these people nurture the creative process of actualisation, The Alzheimer’s suffers who no longer have self consciousness and the Morbidly Obese who are trying to deal with self consciousness. I would like to embrace a new way of viewing Alzheimer’s and Morbid Obesity, by providing adequate space for their potential actualization. The concept of this project then is of BECOMING the aesthetic is MOD. This was my graduation project. There was an open brief. We were asked to find an appropriate site for a use of our choosing as long as it was plausible.